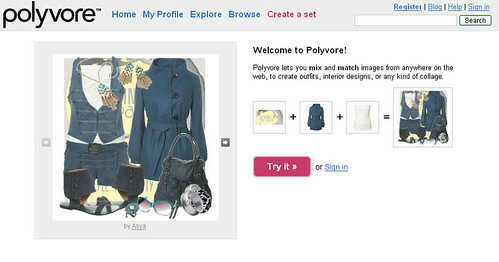 Polyvore is an amazing website that’s revolutionizing the way we shop online. Their web-based application is user-friendly making it easy for you to import images from any online store and create a virtual ensemble in your browser. Each item used within a set will link back to the online store where it’s available for purchase. This makes it easy for you to track where you found the item or if you’re like me, discover new retailers from sets created by other Polyvore addicts. One you publish a set, you can share it with your friends online to get their opinions. You can even print it out as a shopping guide or save your sets as a part of your fashion wish-list (that’s what I do). For an interesting post on how retailers can leverage Polyvore’s platform, read “Why should retailers pay more attention to social shopping on Polyvore?” by Sarah Simmons. A couple of improvements I’d like to see on Polyvore is 1) the ability to move the clipper box when adding tags – it appears in the upper right hand corner and blocks my view of the products details. And 2) enable right-click so instead of having to go to my toolbar, I can right click an image directly to Polyvore. Very cool site indeed. I’m going to most certainly give it a try! BTW, I really like this site as well and have subscribed via RSS. Keep ’em coming girlfriend! The D40 on your flickr has a lot of promise! I look forward to seeing more! Keep it up! (Yay, first AND second comment LOL). You should definitely give it a try! I’ll be posting their video tutorials for the Clipper and Editor so stay tuned!